Here is an excerpt from Keith Haske's Uptempo Basketball System - Pressure Defense, Pressure Offense. Players must have active hands and keep them high to get deflections. Keith has found that if they are able to get 20 or more deflections in a game, they almost always win that game. So it's important for you to require your players to keep their hands high and active to encourage deflections. Their hands should be high in traps, one close outs, and passing situations. 2 - Pressure the Ball and Get "Up"
Force the speed dribble and get up on the ball (have to be close). Common mistake is to back off your man. Need to enforce ball pressure constantly. Players must be somewhat disciplined when they "hit" and double team. If the dribble is under control, they should not hit and double team. This can cause disadvantage situations. The exception to this rule is when the dribbler is in a prime trapping spot (corner or half court sideline). Players and coaches should also watch to make sure they are hitting at the right time. It's beneficial to learn good timing. Once the ball is passed out of the trap, your team must learn to turn and sprint. They should anticipate that they pass out of the trap and be moving as the ball leaves the passer�s fingertips. You need a safety valve to protect from over the top passes and to limit lay-up opportunities. The pressure will force your opponent into lazy passes. Your team can take advantage of this by anticipating those mistakes and stepping into passing lanes. Because the press can look different almost every time down the court, your players must always be communicating. This will create unity in your team�s motion and it will also create more havoc for your opponent. This system requires your team to always be working. The style is not effective if you are not pressuring, pressuring and pressuring. As a coach, you must remind your team to always be aggressive by rewarding aggressive play. The pressure system is easy to learn but you must also continually work on it every day in practice. 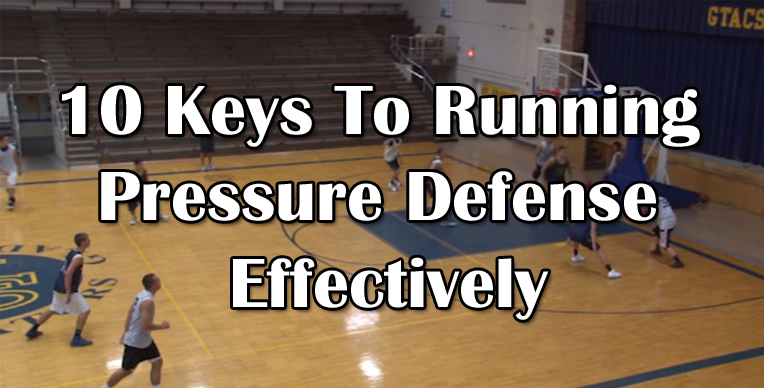 As coach Haske says in the video, working on the pressure gets the sweat going at practice. This is something you have to be committed to and practice. Keith thinks this works best if you commit to it and always press, unless you are way up. It's not something you do against certain teams and not against others. It's a culture.